Our monthly Drink and Draw nights are very relaxed affairs. We usually have an activity to help get the creative juices flowing but there's no pressure to take part. If you'd just like to come along for a chat with like-minded people then please do. ​All levels of talent is welcome! So come along for a tipple and a scribble. We're always keen to meet new people. More details about our Drink and Draws can be found on our Facebook page. All details below are subject to change. All Drink and Draws listed below are held at the 'Three Cups' pub, 45 Newnham Street, Bedford, MK40 3JR (see below for location). ​They start at approximately 7.30pm but feel free to drop in later. We ask for a minimum of £1, which goes towards the drawing materials we provide and future events. Over 18's preferred. ​This month we're teaming up with Beerfly, an independent beer shop in Bedford, for our Drink and Draw. Using our templates, we'll be designing beer labels, bottles and cans - taking inspiration from Beerfly's large range of local, national and imported modern beers and ciders. Drinkers and non-drinkers are all welcome! Beerfly is situated at 45, St. Cuthbert’s Street, Bedford, MK40 3JG. It's only a short walk from our usual location at the Three Cups pub and just round the corner from Bedford Rugby Club. We'll be back at the Three Cups next month. 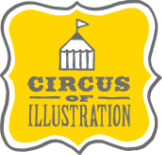 The Circus of Illustration welcome all creatives to Sketch Up! Sketch Ups happen every other month, where we host a drop-in meeting for creative types to chat and doodle in a relaxed atmosphere. No prescriptive drawing tasks here: its your chance to work on your own sketchbook, ask for advice from other creatives, and network over a cheeky drink. As always this is a free, drop in event for adults. We encourage you to bring your own drawing materials, but will have some on-hand if you're caught short.